Today at Apple" was launched in May 2017. While marketed as something new, effectively it was a rebranding and expansion of workshops and other events the company was already holding. Common options include things like Photo and Sketch Walks, basic Swift coding sessions, and the Kids Hour, which alternates between topics. Some stores offer Photo and Music Labs, and more advanced customers can attend "Pro Series" events for subjects like Final Cut Pro. Only high-traffic Apple stores will typically play host to Perspectives and Performances, in which musicians and other artists will put on a show and/or talk about their work. Today at Apple directly targeted the more than 500 million people who visit the Apple stores each year. Dozens of sessions led by Apple Creative Pros are offered every day, including Photo Walks, Sketch Walks, Kids Hour, Music Labs, and many more. Customers can also attend special programming and live performances by renowned musicians, artists, and creative leaders ranging from musicians like RZA, to illustrators like Seb Lester, to filmmakers like Michele Gondry. Bringing Today at Apple to life was a massive undertaking that required the most significant redesign of the Apple Store since it was opened. Stores were reimagined as town squares with new public spaces called Forums featuring stunning 6K monitors. An entire curriculum was created from scratch for learners of all levels, with dozens of free sessions offered every day. To enable sign-ups for more than 65,000 sessions each week, a website and reservation system was built from the ground up. 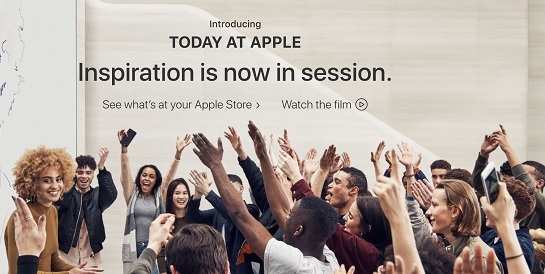 Since Today at Apple launched in May of 2017, more than 600,000 sessions have taken place and millions of people have participated. Renowned musicians, artists, designers, and community leaders have used the platform to share their work and inspire the next generation of creatives. Every day at every Apple Store around the world, customers are expanding their creative skills in Photo Walks, Sketch Walks, Studio Hours, Coding sessions, and so much more. And new programs are being added all the time. At the Cannes Lions 2018 awards ceremony, Apple was said to have "reinvented" the in-store experience. A video montage showed a mix of news reports and promotional imagery, including a CBS interview with Apple retail head Angela Ahrendts.